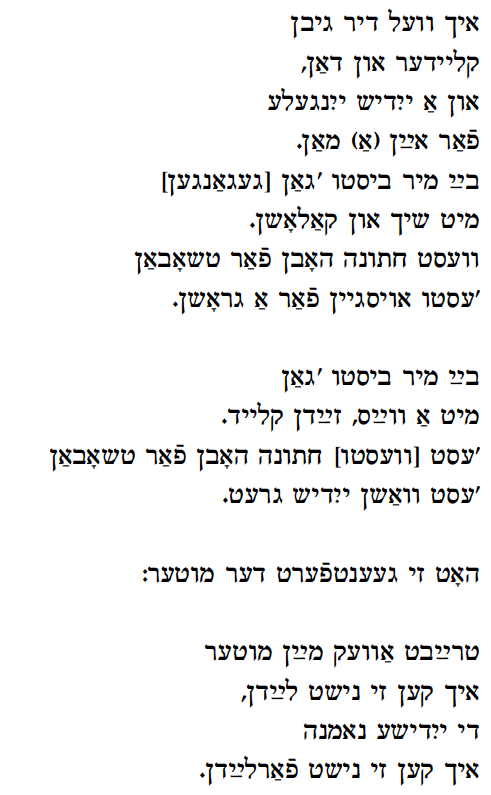 Lifshe Schaechter-Widman (LSW) remembered this song from a purim-shpil in her home town, Zvinyetshke, Bukovina. The “Mekhires yoysef” Purim pay about the selling of Joseph was so popular that LSW term for the Purim players was “Yosef-shpiler”. This song sung by the Joseph character describes the attempted seduction by Potiphar’s wife (Genesis 39-40). It also is a good example of the open, carnivalesque atmosphere of the Purim holiday when even sexual topics could be referred to in public. ikh zol mit ir shlufn. az Got vet mikh shtrufn. az Yitskhok iz mayn zeyde. az Rukhl iz mayn mame. that I should sleep with her. and remembered – God would punish me. and remembered – Isaac was my grandfather. and remembered – Rachel was my mother. In toyznt naynhindert ferter yor (In the Year One Thousand Nine Hundred and Four), performed here by singer Feigl Yudin for a 1980 (circa) concert produced by the Balkan Arts Center (now the Center for Traditional Music and Dance) is one of a number of Yiddish songs about the Russo-Japanese war; a conflict that was fought between the Russian Empire and the Empire of Japan from 1904 – 1905. The build-up to the war began in the late 1890s as one can see from the variants of this song which all begin with a different year – 1899 – “In toyznt akht hundert nayn un nayntsiktn yor”. See: Beregovski/Slobin Old Jewish Folk Music page 231, with music, and also see the endnotes there for other variants. 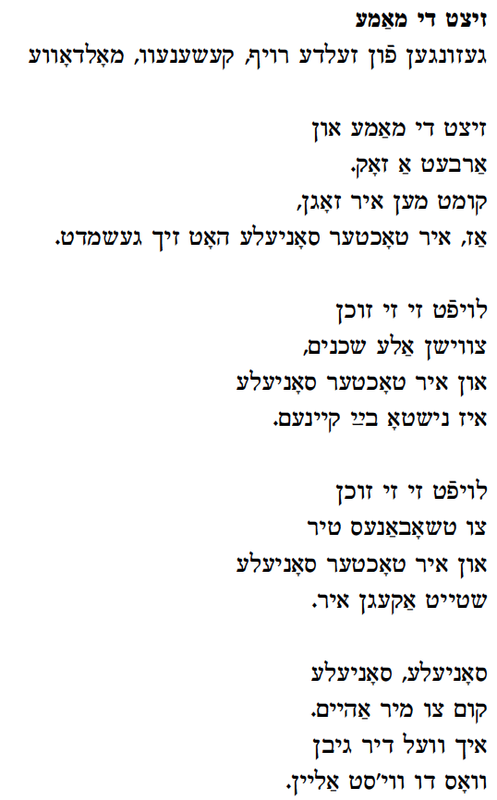 A version is also found in Yiddish Folksongs from the Ruth Rubin Archives (ed. Slobin/Mlotek, 2007) with music. At the bottom of this post we have attached an interview with Yudin from an issue of the magazine Sing Out!, Volume 25, #5, 1977. I received help with the text of Yudin’s song from Paula Teitelbaum, Jason Roberts, Sasha Lurje and Zisl Slepovitch. Though, I am still not sure, in the first verse, what is meant by the expression di godnikes por/ gor (?) Your comments on this are welcome. Also note she does not sing the obvious dialectical rhyme in the third verse “miter” with “biter”. Far mir iz geblibn di ergste fir yor. A gantse fir yor verstu nebekh fin mir poter. Men zol mir nit naznatshen in dalniy vostok. 3) Zay zhe mir gezunt mayn tayere muter. Dir iz dokh shlekht un mir iz dokh biter. 4) Zay mir gezunt mayn tayere kale. Nokh dir vel ikh benken, oy, mer vi nokh ale. Men zol mir nit naznatshen keyn dalniy vastok. Es zol nor nit zayn vi a panske milkhome. Oy, zayt zhe ale gezunt un bet far mir Got. Men zol mir nit naznatshen oy, in dalniy vastok. there was a terrible recruitment/draft. These were my worst four years. They should not assign me to the Far East. You feel so bad and I feel miserable. 4) Fare well my dear bride. I will long for you, o, more than the rest. if there were no lordly war [war created by the Lords]. The singer of this week’s ballad, Erev yon-kiper noent tsu kol-nidre (The Eve of Yom-kippur, Right Before Kol-Nidre), is Sarah (Sore) Kessler. The recording is from the Ruth Rubin Collection at YIVO. Rubin recorded it in 1949. This song tells of a Jewish girl running away with a non-Jewish boy on the eve of Yom-kippur. In Kessler’s version he is referred to as a “sheygets”. In two other versions from the Sofia Magid collection (Unser Rebbe, unser Stalin edited by Elvira Grozinger and Susi Hudak-Lazic, Harrasowitz Verlag, Wiesbaden, 2008) he is called an “eyn orl fun kristen geboyrn” (one who is uncircumcised born a Christian). We have included the Kessler audio, the transliteration and translation, scans of the Magid versions and a PDF of the Yiddish words in Yiddish as sung by Kessler. The transliteration reflects her Yiddish dialect. The singer, Soreh Kessler, from the Polish town of Czyżew (Yiddish name:”Tshizheve”) between Warsaw and Bialystok, recorded songs for Ruth Rubin at the beginning of Rubin’s field recording project in New York, 1947 to 1949. When comparing the Magid versions and Kessler’s version it is clear that a crucial scene has been left out of Kessler’s: the one in which the Christian boy tells the runaway girl that he never loved her and was just kidding. She then returns to find that her parents died from grief. One word is not clear to me – the fourth line of the first two stanzas – “____ un tinkl”. In Magid’s versions the word is “nakht” but here it sounds like “khmurne”, which means gloomy. Recording is courtesy the Max and Frieda Weinstein Archive of Recorded Sound at the YIVO Institute for Jewish Research (Lorin Sklamberg, Sound Archivist). Thanks also to Dr. Paul Glasser for help with the town name. SPOKEN: Dos lid hob ikh gehert in mayn shtetl Czyzew in poyln. Az es vet shoyn zayn tsvantsik, oder finf un tsvantsik yor tsayt. ven me geyt shoyn in talis in kitl. In droysn vert khmurne (?) un tinkl. bay di veksene likhtlekh in vinkl. Ze bentsht oykh ir tokhter, ir bas-yekhidl. In droysn vert khmurne un tinkl. a simen hot es zi im gegeybn. Dort kletert eyner ariber iber dem parkan. Dos iz ir gelibter geveyzn. az mit a sheygetz iz zi antlofn. iber berg un shteyner un toln. kayn futer, kayn muter nisht getrofn. Oyf deym beys-almon lozt zi zikh loyfn. Zi iz shoyn arunter fun zinen. a teyter hot men zi gefinen. Spoken: I heard this song in my town Czyzew in Poland. It must be 20 or 25 years ago. Outside it is gloomy and dark. by wax candles in the corner. She also blesses her daughter, her only daughter. Outside is gloomy and dark. she gave him a sign. they did not find their only daughter. she ran off with a non-Jewish boy. but no father, no mother did she find. To the cemetery she wildly runs. She has already lost her mind. When ballads have been presented on the Yiddish Song of the Week we have sometimes emphasized the parallels with other international ballads. This week we present a ballad type that is not to be found internationally, certainly not in the Anglo-British-American tradition – a ballad that describes the conversion of a child to the Christian faith; a shmad-ballad. The verb shmadn in Yiddish means to convert to Christianity. This week’s entry has two versions of the same shmad-ballad. There are a number of others and judging by the geographic spread of the singers, we could conclude that it is at least as old as the 19th century. 1) The first version Zitst di mome (As Mother is Sitting) comes to us courtesy of the AHEYM (Archives of Historical and Ethnographic Yiddish Memoirs) project at the University of Indiana in Bloomington. This project has been directed by professors Dov-Ber Kerler and Jeff Weidlinger. Special thanks to AHEYM project manager Anya Quilitzch who prepared the video clip. The singer Zelda Roif of Kishinev (Chișinău), Moldova, sings in her Bessarabian dialect, marked especially by her toto-mome-loshn. Tate (father) in her dialect becomes tote, mame becomes mome and geshmadt becomes geshmodt (converted). Her version has a distinctly Romanian flavor since the daughter Sonyele falls in love with a shepherd (cioban). In classic ballad form, the first few verses set the action then turn into a dialogue between mother and daughter, in which the mother tries to convince her daughter not to convert. The mother fails and the last two lines spoken by the daughter – “I can’t stand the Jewish faith” is quite a powerful (unhappy) ending. 2) The second ballad Bentsik der shoykhet (Bentsik the Ritual Slaughterer) is sung by Lillian Manuel of Suchowola in northeast Poland, and the recording and comments were provided by her grandson, the Yiddish linguist Dovid Braun. By comparing the two ballads we see the similar dialogue structure though in different settings. The ending of Bentsik der shoykhet is also quite shocking. The Yiddish shmad-ballad song type deserves a longer analysis than is possible here. Among other versions collected is one in Sofia Magid’s work printed in “Unser Rebbe, unser Stalin” edited by Elvira Grozinger and Susi Hudak-Lazic (Harrasowitz Verlag, Wiesbaden, 2008) – “Rokhele” (pages 288-289) recorded in Volyn, 1928. The Magid version is a variant of the two presented today and recounts how Rokhele ran away with the priest’s son. In the longer text provided (page 555) a similar dialogue between parent and daughter can be found. A recording of the song is included in the DVD that comes with the volume. Please find Yiddish texts at the end of this posting. az ir tokhter Sonyele hot zikh geshmodt. that her Sonyele has converted. is not found by anyone. at the door of the shepherd. is standing across from her. vesti oysgeyn far a groshn. you will die for a penny. mit a vas, zadn kleyd. you will wash Jewish laundry. ikh ken zi nisht ladn. Ikh ken zi nisht farladn. BENTSIK DER SHOYKHET (sung by Lillian Manuel, known in her shtetl Suchowola, NE Poland, as “Libe Yankl dem shvartsns”, to her grandson David / Dovid Braun, in the Workmen’s Circle Home for the Aged, Bronx, NY, ca. 1988) *see comments by David/Dovid Braun at the end of this translation. Feygele zayn tokhter hot zikh opgeshmadt. Feygele his daughter has converted to Christianity. kedey er zol kenen zayn Feygelen deryogn. So that he could catch up to his Feygele. Bentsik der shoykhet geyt arayn in a kvartir. Gefunen hot er Feygelen bam kloyster fun tir [in kloyster bam tir]. Bentsik the slaughterer goes into an inn. What he’s found is Feygele in church by the door. “Kum aher mayn tokhter, kum tsu mir aheym. “Come here my daughter, come home to me. un im af tselokhes dem sheygets a kish. and to spite him, [she gives] the gentile boy a kiss. un im af tselokhes tseylemt zi zikh iber. and to spite him she crosses herself. Feygele iz gegangen in zaydene zokn. Az zi vet peygern vet klingen di glokn. Feygele was wearing silken socks/stockings. When she croaks, the [church] bells will ring. Af morgn bay tog: a yomer, a klog! Bentsik der shoykhet iz geshtorbn in mitn tog. The next afternoon: alas and alack! Bentsik the slaughterer died in the middle of the day. In the Yiddish original, I have placed in square brackets [ ] a few words Mrs. Manuel sang on an occasion a few years earlier when in better health and with a yet crisper memory. It is clear how those words make better sense and/or form a more satisfactory rhyme. Also, the final two stanzas were reversed in that earlier rendition, which makes more sense: walking neither with shoes nor barefoot but in socks or stockings is a sign of mourning. So first her father Bentsik has died, then she has donned traditional Jewish mourning garb, and finally we are warned that when the end comes for her, the apostate, mourning will be signaled by church bells. Kh’vil nit kayne kleyder, kh’vil nit kayn nadan. Aleksandern hob ikh lib un er vet zayn mayn man. ‘I don’t want any clothes, I don’t want any dowry. With this stanza, we’re enlightened as to what’s behind Feygele’s conversion from yiddishkayt, and religious philosophy doesn’t seem to be the motivating factor.